Can you help us to identify the man peering around the door in this photo? According to a comment by Janice Teichroeb on this photo, her mother has identified the persons in the photo as follows: Back row from left to right: Mrs. Matheson (mother of Mary Town nee Matheson), Mr. Matheson (father of Mary), Mr. Davies (father of Irene Town nee Davies), Mrs. Davies (mother of Irene). Front row from left to right: Mr. W. C. Town (proud Grandfather of the three baby girls and father of Jack, Harry and George - the fathers of the babies), Mrs. Georgina Town nee Phillips (Grandmother), Mrs. Mary Town nee Matheson (wife of Harry) and daughter Jennifer, Mrs. Irene Town nee Davies (wife of George) and daughter Lynda, Mrs. Rose Town (wife of Jack) and daughter Susan, Mrs. Robert Town (mother of W. C. Town). William Clarence Town (1885-1963) was a prominent businessman in the town of Whitby. He operated a furniture business starting in 1927 at 126 Brock Street South and in 1954 with his sons, he opened a funeral chapel on Dundas Street East. Mr. Town was a devoted member of All Saints' Anglican Church and served as a warden for the church for many years. Additionally, he was a charter member of the Whitby Rotary Club, and the Whitby Chamber of Commerce. 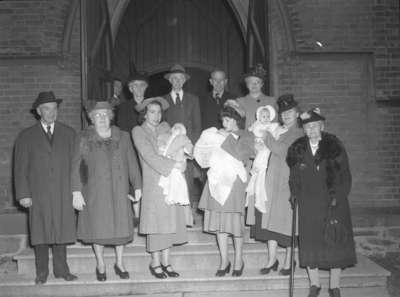 W.C. Town Christening at All Saints Church, Whitby, Ontario, 1948, Marjorie Ruddy. Whitby Archives A2013_040_1221.